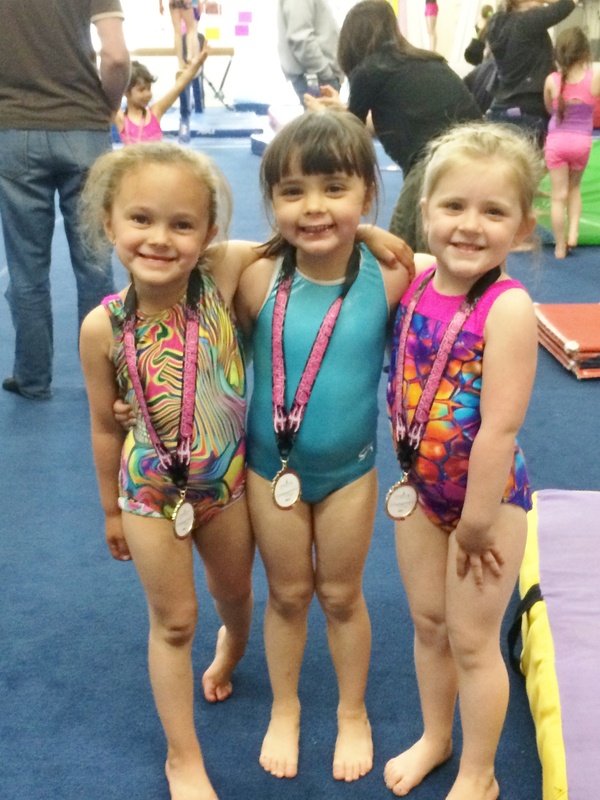 Our Tots class is perfect for toddlers with an adult companion. We offer this class at a time when the entire gym is open for exploration. This child directed class allows each child to comfortably move around with an adult accompanying them. There is no definitive structure to the class. However, the gym is preset with many planned, exploratory activities and our staff is always available to direct and assist. Half way through the class, there will be circle time where there will be songs and a skill will be taught and reviewed. Dress code: Clothing that is non-restrictive, preferably a t-shirt and shorts with an elastic waist band, or a one piece outfit with no buttons, buckles, zippers or snaps. Children will participate in bare feet. The accompanying adult should be in comfortable clothing and stocking or bare feet. Each structured class is divided into 10-15 minute segments which breaks down into 4 different locations per class. There are 3 major circuits that have 5-7 different activities within them and 2 locations that incorporate hand/eye or locomotor activities. The skills involve physical education type activities that incorporate basic motor skills. Each lesson plan is repeated for 2 weeks and many skills are repeated on a normal basis. Class ratio is 6 to 1. The mastery of skills is not necessarily our highest priority. For many three year olds, this is their first separation from Mom. One of our goals is to make this separation as comfortable as possible. Our second goal is to have each child listen to and respond to the instructor. This is accomplished through much positive reinforcement and repetition of activities within the lesson plan. Dress Code: Clothing that is non-restrictive, preferably a t-shirt and shorts with an elastic waist band, or a one piece outfit with no buttons, buckles, zippers or snaps. Children will participate in bare feet. Long hair should be tied back away from face. Each structured class is divided into 10-15 minute segments which breaks down into 4 different locations per class. There are 3 major circuits that have 5-7 different activities within them and 2 locations that incorporate hand/eye or locomotor activities. 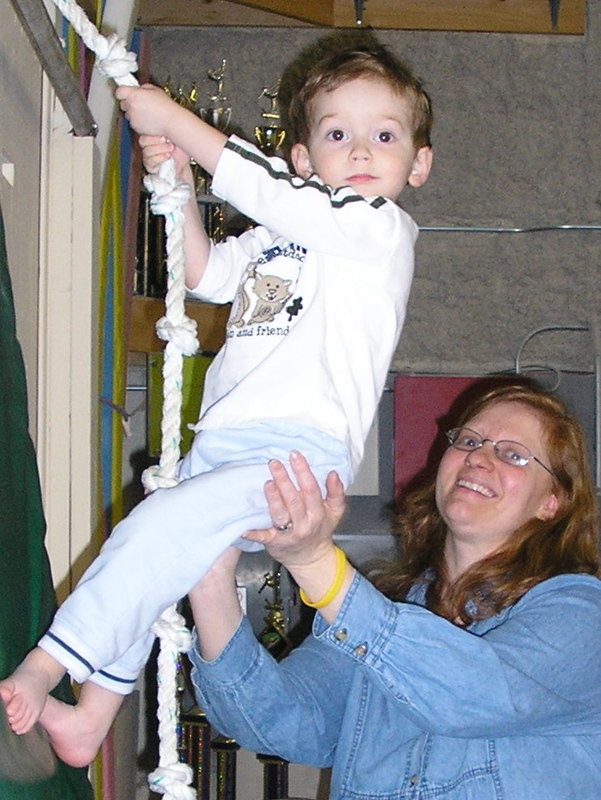 The skills involve physical education type activities that incorporate basic motor skills. Each lesson plan is repeated for 2 weeks and many skills are repeated on a normal basis. Class ratio is 7 to 1. By the time a child reaches 4 years of age, listening skills are increasing. This is when we begin to work more in on perfecting basic skills. 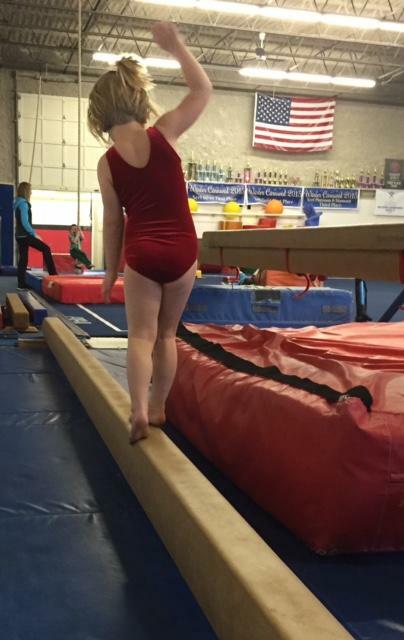 Skills such as forward roll, walking down a low beam without falling off, lifting toes to a bar, and jumping correctly off of a vaulting board should be performed comfortably. The children can begin to analyze the correct and incorrect parts of these skills.